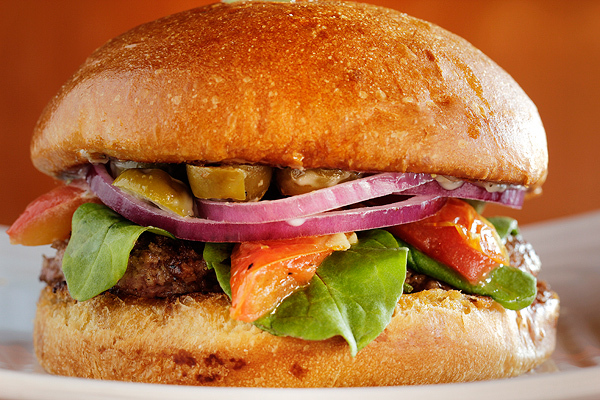 Three new gourmet burger joints you should get to know. Randy Kienast is a successful home builder. One of his best friends is Ben Spies, a world-class MotoGP rider. You’d think the twosome would be happy to spend their spare time knocking back a few beers and talking about guy stuff like crashing a motorcycle at 190 mph (which Spies has done) or installing a new shower pan. But that would be too easy. So Kienast found a rickety one-story house built in 1925, and together they turned it into Stackhouse, a gourmet-ish burger bar on Gaston, near Baylor Hospital. Thankfully they had the sense to hire someone who knows something about cooking meat, James Rose, the former chef at Bob’s Steak & Chop House on Lemmon Avenue. The people of the surrounding neighborhood are grateful to have a new place to hang. They lost the 47-year-old Metro Diner a year ago, and Stackhouse seems to have picked up Metro’s customer base. At lunch, the dining rooms and patios swell with hospital staffers and construction workers. In the evening, couples and families meet for drinks and dinner. Later, the tattooed Deep Ellum crowd stops in for buckets of beer. The menu is straight down the middle: burgers, sandwiches, salads, sides, and desserts. The meat patties are 6 ounces, and you can order a single or a double and customize your burger from an extensive list of items such as avocado, grilled onions or mushrooms (or both), chili, and fried egg. We ordered one “pink” with smoked Gouda, and it was delivered “done,” but the hot cheese added the necessary moistness. Another burger we ordered “done” with bacon, grilled onions, and cheddar cheese, and even though it was “pink” we fought over the last bite. Rose also puts together a nice Cuban sandwich by pressing Canadian bacon, ham, Swiss, thinly sliced pickle, and mustard between two pieces of a brioche-style hoagie roll. There is a wonderful rush from the horseradish Rose adds to his house-made mustard. Onion rings are thin, concentric circles of sweet onion gently battered and fried. They are almost too thin, a problem I remedied by consolidating a fistful and stuffing it into my mouth. Ugly approach but same effect. The house-made potato chips are thin and perfectly salty-crispy. They are a must for beer drinkers. A warm chocolate chip walnut brownie served with two scoops of Blue Bell vanilla ice cream and chocolate butter nut sauce is a must for chocolate freaks. The upstairs patio is a great place to sit and shoot the breeze as you watch the sun set behind the Dallas skyline. If Spies or Kienast happens to be in the house, you can talk motorcycles with the former or shower pans with the latter. They can’t quit their day jobs yet: Stackhouse is within spittin’ distance of Adair’s, Twisted Root, and the Angry Dog. Three cheers for Mariel Street for breathing new life into the dull Forestwood Shopping Center at the corner of Inwood and Forest. She resuscitated the worn-out space that once housed Marshall’s Barbecue and Roma’s Italian and created a vibrant, gourmet burger joint with “tree-free” compostable packaging and a reduce-reuse-recycle state of mind. Mariel is the daughter of Dallas veteran restaurateur Gene Street, a man who has tried to chicken-fry every animal on earth. But Ms. Street’s chicken-fried burger is better than anything I’ve ever tasted in a Gene Street restaurant. It’s thick and juicy, and the batter doesn’t drip grease, so the shiny buns remain relatively firm. The menu offers more than a dozen options, ranging from bison to beef to lamb to turkey. Vegetarians will be pleased with the Woodstock. The patty is made from chopped vegetables, chickpeas, and grains, and it’s topped with Swiss cheese, avocado, and tomato, all served on a wheat bun spread with basil garlic aioli. After multiple visits, two beef burgers stood out, both made with ground brisket, chuck, and tenderloin: The Napa, with gorgonzola cheese, arugula, tomatoes, onion, and big chunks of green olives; and The Nooner, a messy (in a good way) concoction of American cheese, applewood-smoked bacon, ham, and hash browns covered with a fried egg. I can’t blame the bread for breaking down on this wobbly yet delectable creation. Side dishes include fresh-cut sweet potato fries ($2.50) that are thick and salty. Regular fries are the skinny variety. I’m not a fan of skinny fries anywhere. It doesn’t matter if they are fresh or frozen; they get cold and mushy too fast. However, I am a fan of large, thick-cut onion rings, and Ms. Street puts out excellent battered, peppered rings fit for a high-end steakhouse. Except she charges only $4. 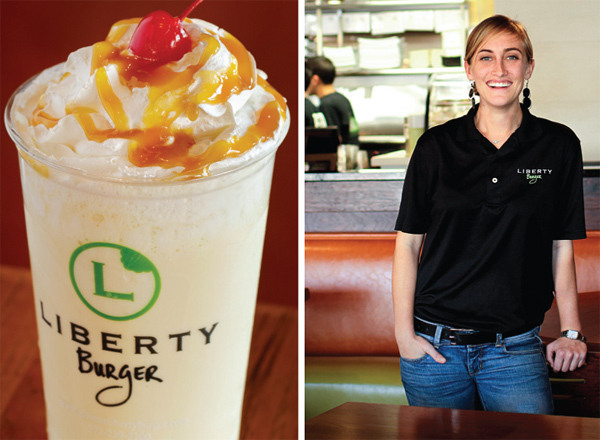 Liberty Burger has been a hit since it opened in early November. The lines at lunch snake out the door, and the crowds at night are an interesting mix of well-dressed Preston Hollow families, older couples, and kids in pajamas. The beverage list takes care of parents and children. The shakes, made with a vanilla custard base, feature the basic chocolate, vanilla, and strawberry, but I recommend one of the more sophisticated blends such as the caramel and sea salt or the Nutella and graham cracker. If you need something stiffer, Ms. Street offers beer, wine, frozen margaritas, and a small but stately stock of spirits.